Instant Pot has become an “IT” thing around the U.S. Although the concept of it has been around for quite some time in Europe and in Asia. I wanted to get my hands on one for a long time. When Instant Pot introduced its pressure cooker, my sister-in-law was the first to get it. I waited for her experience and recommendations. After she gave me a massive thumbs up, it was time for me to get one, too. I’ve been experimenting with it for quite some time and I’ve managed to tweak quite a bit of my recipes to be cooked in it. The biggest benefit of using a multi-cooker (or the pressure cooker functionality) lays in its ability to preserving all the vitamins in the food. Naturally, if you make a vegetable soup using conventional methods, ingredients of the soup will end up losing most of their nutrition, during a longer cooking period. The second most important thing is the utilization of time. You can cook food in a record short time and still have delicious tasting food, tender, meats and amazing broths. 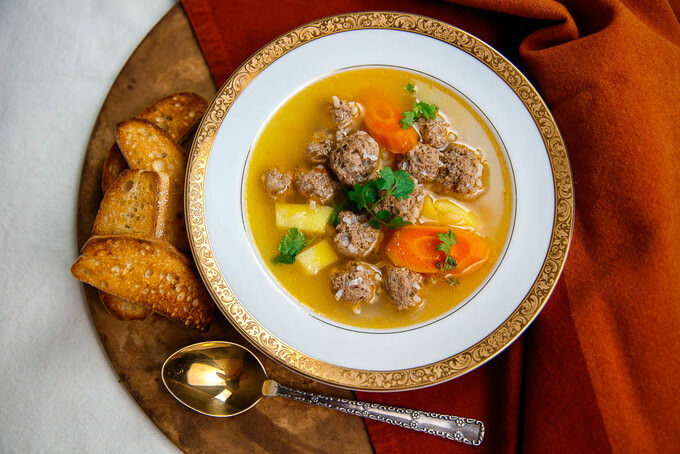 This meatball soup recipe is no exception. I will write more about Instant Pot and multi-cookers in a different post. Let’s get to our soup recipe, shall we? It is a very simple soup, really. It is good for those days when you want to have a comfort food. Something to warm up your insides. A portion of the soup is approximately 150 calories. Place 1/2 lb ground beef in a medium bowl. 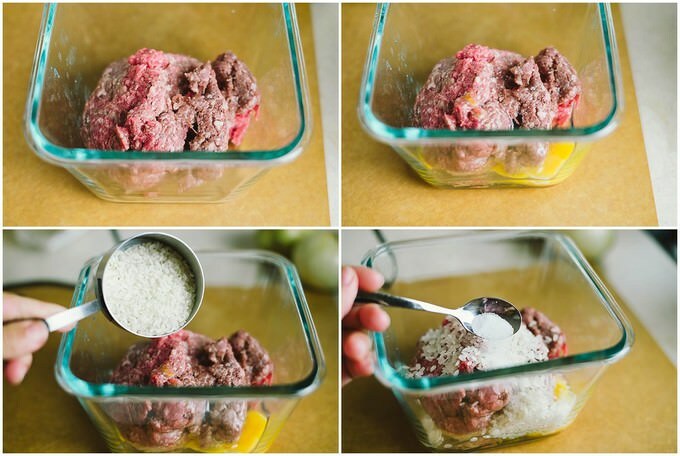 Add 1/3 cup of rice, 1 egg, 1 tsp of salt. Cut the 1 onion in half, chop one half of it and add the chopped part into the meat mixture. Mix everything well by hand. 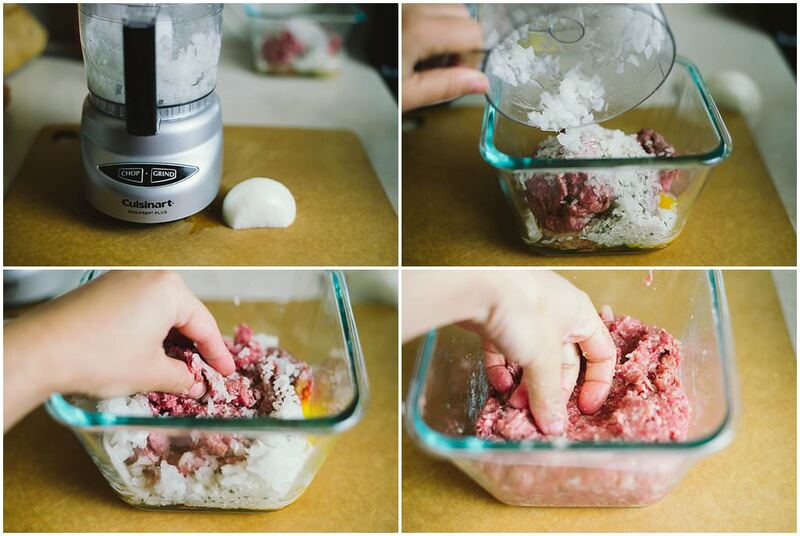 Round 1 inch-wide meatballs from this mixture and set aside until needed. You can also perform this step right before adding meat into the pot. 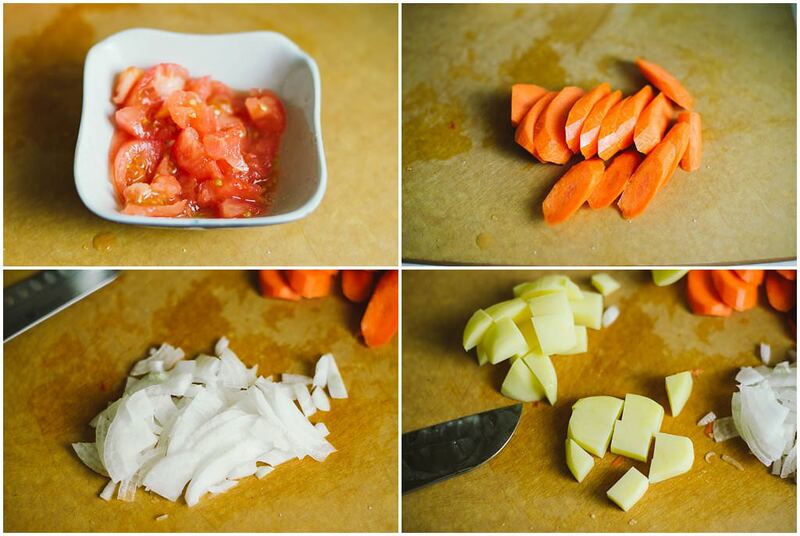 Slice 1 tomato, slice 1 carrot, chop the rest of the 1/2 onion, cube 1 potato and set aside until needed. Heat up your pressure cooker or your Instant Pot. In Instant Pot you would use saute function, add 1 TBSP of the oil of your choice and wait until the butter melts. One thing with Instant Pot is that it may take a little longer to brown ingredients. Once the butter melted, add the chopped onions, and saute until transparent and slightly cooked. Add the sliced tomatoes and saute for about 5 minutes. Add carrots and cubed potatoes to the Pot and saute for another 3-5 minutes. Add 2 tsp of salt, pepper, cumin, bay leaf and chopped garlic. Saute for 2 minutes. Pour 6 cups of water or the vegetable broth. You do not have to bring the water to boil with a pressure cooker method of making this soup. 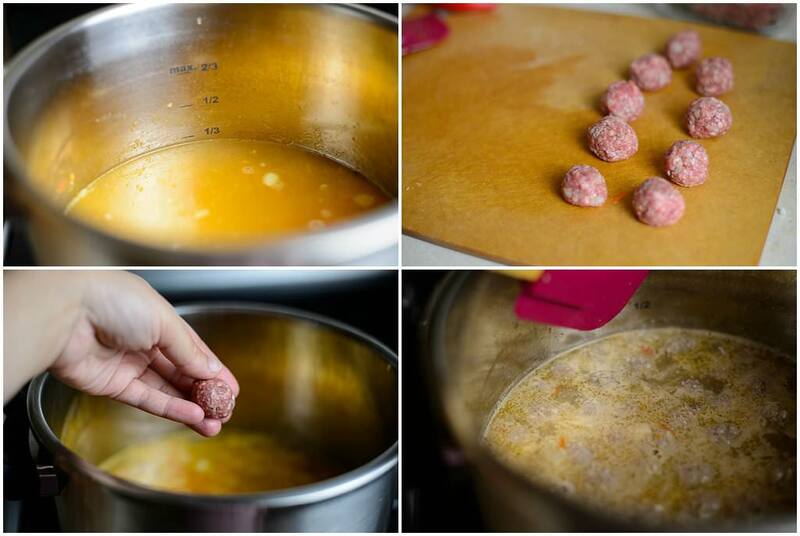 Add the rolled meatballs in to the water and close the lid of the pot. If you are using a regular pressure cooker, you will need to time it yourself. Ideally, timing should start from the time the lid is sealed and the hear a slight hiss in coming from the lid. You will also notice that the pressure button will come up. The beauty of Instant Pot is that it will do the job for you. It will only count time time once the pressure is built and the lid is sealed. You can press the soup setting on the Instant Pot and modify the time. However, I like using the MANUAL setting for this soup. I press the MANUAL on the dashboard, select LOW pressure and set the time to 12 minutes. Once the time is up, let the steam out of the pot. Check the soup for the taste. Add salt if it needs any and your soup is ready to serve with a side of grilled toast! 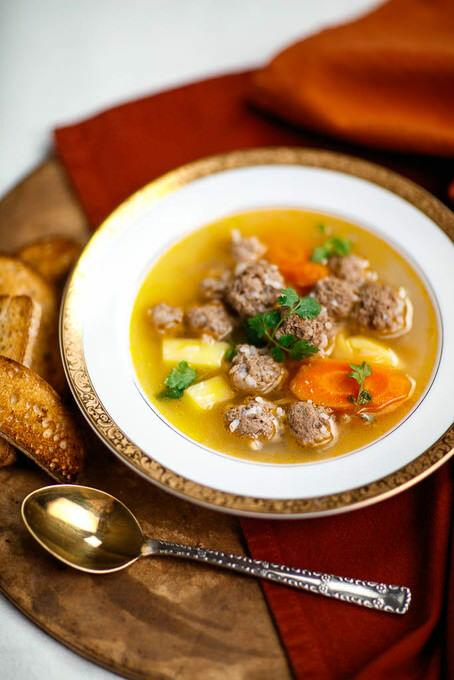 I hope you enjoy this delicious, easy meatball soup recipe using Instant Pot. Ready for the easiest Meatball Soup in the planet? The biggest reason why it is easy is that it is made by utilizing a pressure cooker or a multi-cooker which in the U.S. goes by the name of Instant Pot. 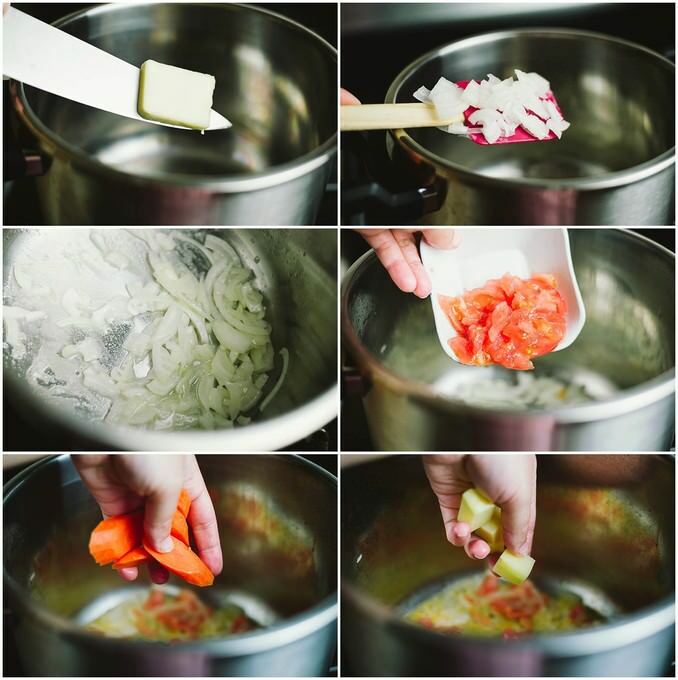 Cut the 1 onion in half, chop one half of it and add the chopped part into the meat mixture. Mix everything well by hand. Round 1 inch wide meatballs from this mixture and set aside until needed. You can also perform this step right before adding meat into the pot. Heat up your pressure cooker or your Instant Pot. In Insta Pot you would use saute function, add 1 TBSP of the oil of your choice and wait until the butter melts. One thing with Instant Pot is that it may take a little longer to brown ingredients. Once the butter is melted, add the chopped onions, and saute until transparent and slightly cooked. Add the sliced tomatoes and saute for about 5 minutes. Add carrots and cubed potatoes to the Pot and saute for another 3-5 minutes. Add 2 tsp of salt, pepper, cumin, oregano, bay leaf and chopped garlic. Saute for 2 minutes. Pour 6 cups of water or the vegetable broth. 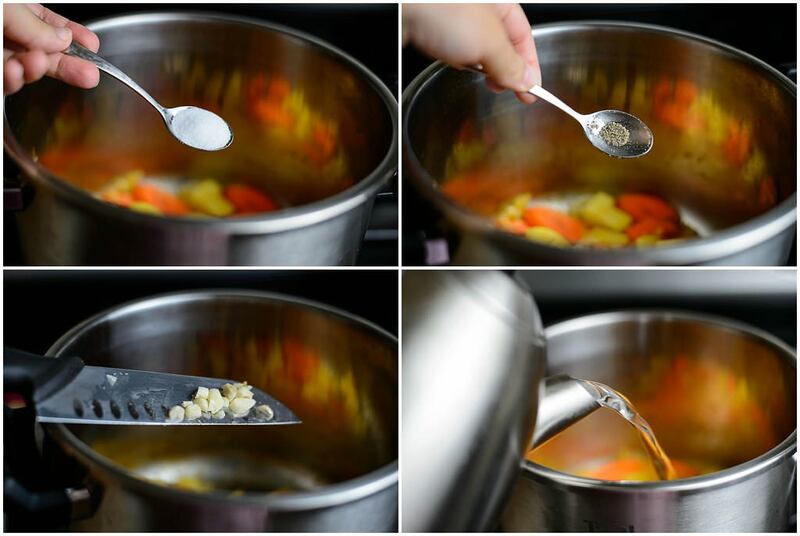 You do not have to bring the water to boil with a pressure cooker method of making this soup. Add meatballs into the water and close the lid of the pot. If you are using a regular pressure cooker, you will need to time it yourself. Ideally, timing should start from the time the lid is sealed and the hear a slight hiss incoming from the lid. You will also notice that the pressure button will come up. The beauty of Instant Pot is that it will do the job for you. It will only count time once the pressure is built and the lid is sealed. You can press the soup setting on the Instant Pot and modify the time. However, I like using the MANUAL setting for this soup. I press the MANUAL on the dashboard, select LOW pressure and set the time to 12 minutes. Once the time is up, let the steam out of the pot. Check the soup for the taste. Add salt if it needs any and your soup is ready to serve! Garnish with the herbs of your choice and voila! Is there a reason you use low pressure? Can high pressure be used? And if yes-how long would you put it for? Thanks so much! Really enjoying your recipes!! Christine, sorry for a late response. Since the meatballs are quite tender (with addition of onion and rice) I prefer using low pressure in order to help the meatballs to preserve their shape. If you would go with high pressure, I would stick to 10 minutes in the cooker. This sounds like a great recipe I would like to try! Unfortunately, my som is allergic to tomatoes (and bellpeppers and chili peppers). Do you have a suggestion for what I can use instead of tomato in this recipe? Thank you in advance and Thank you for a lovely blog! Hi Tatiana, oh boy! That’s a tough one. I would try to use puréed or canned pumpkin puree, squash purée or sweet potato pure. You can add a little bit of a lemon juice for acidity or sumac to give it a wonderful flavor. Hope this helps! What can you use instead of rice in the hamburger. I agree, Diane. I think I like cauliflower in anything.